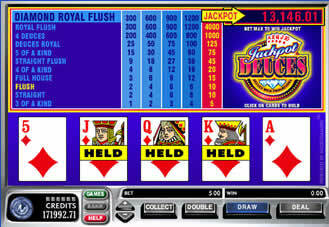 Jackpot Deuces is a progressive video poker game offered at a number of Microgaming online casinos. These casinos do not accept US players. The game Jackpot Deuces is a video poker that is similar to the Deuces Wild payout schedule. Jackpot Deuces also has a Progressive, that is a constantly, accumulating pot of money that can be won if you play for five coins and your hand contains the Ace, King, Queen, Jack, and Ten of diamonds. In other words, if you have a Royal Flush Diamonds you will win the PROGRESSIVE!!! !